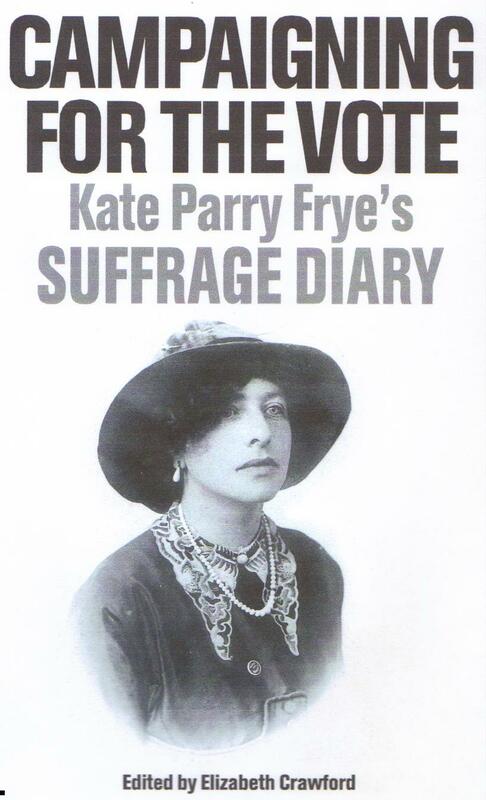 Kate Frye was present on so many important suffrage occasions – including ‘Black Friday’ – 18 November 1910. 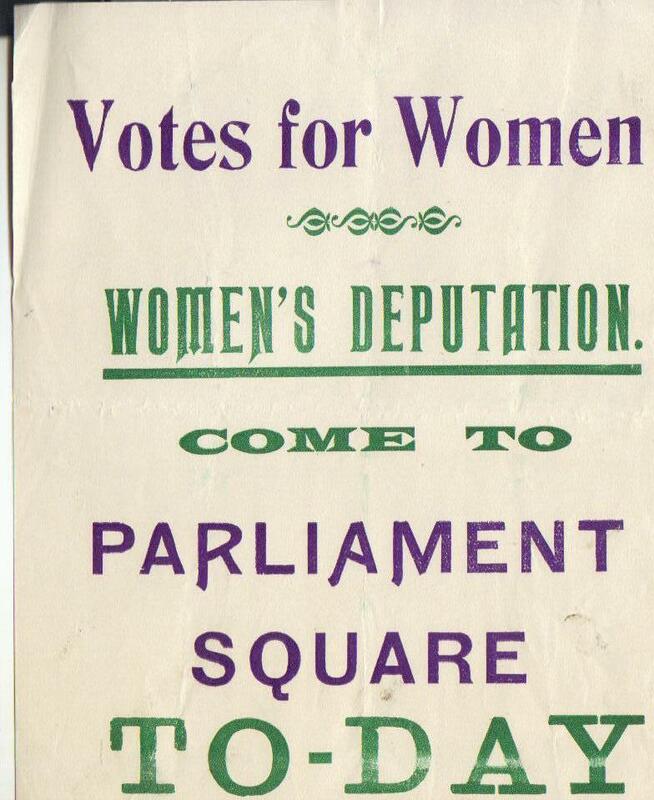 On this day the suffrage societies learned that the Conciliation Bill, on which they had pinned their hopes, would be abandoned as, with the two houses of Parliament locked in confrontation over Lloyd George’s budget, Parliament was to be dissolved. The police were out in force and employed brutal tactics to break up the women’s demonstration. 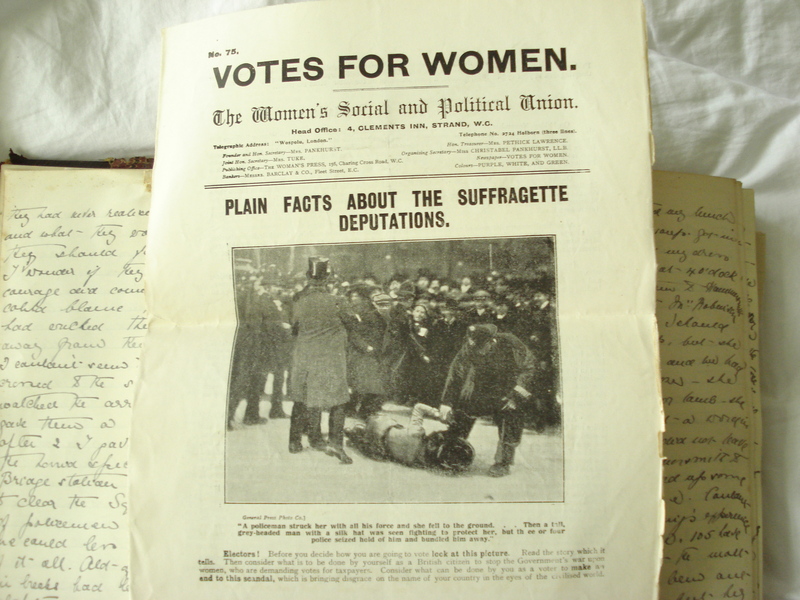 Only a short excerpt of Kate’s ‘Black Friday’ diary entry appears in Campaigning for the Vote because it occurred in the period before Kate began work as a paid organizer for the New Constitutional Society for Women’s Suffrage. 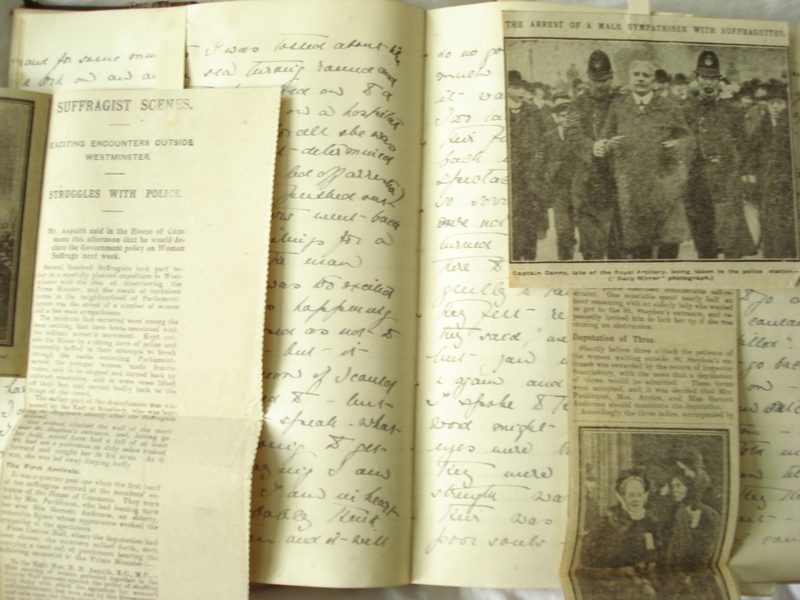 There was, alas, just too much material in her diary to make a book out of her whole suffrage experience. So, for those who would like more, here are full details of Kate’s experience that momentous day. Up in good time. Brushed Mickie [her dog] then took him for a walk – then started at 10.30 for the Caxton Hall. Train from Notting Hill Gate to St James’ Park. I got there about 12 – and the hall was already full and the crowd hanging about were soon after turned out of the vestibule – so I stood some time on the steps. Then from there we were turned into the street and I waited there, chatting with different women, till about 12.40 when the 1st deputation left the Caxton Hall for Parliament Square. They were soon swallowed up in a seething mob and I simply flew with many other women by short cuts to Parliament Square where I landed more or less by chance in the thick of it. One could hardly see the plan of it all amid the hurly burly excitement, shouts, laughter applause & rushes of the enormous crowd which grew every minute. I was almost struck dumb and I felt sick for hours. It was a most horrible experience. I have rarely been in anything more unpleasant – it was ghastly and the loud laughter & hideous remarks of the men – so called gentlemen – even of the correctly attired top-hatted kind – was truly awful. It made all the men and women seem mad together. And the poor women – the look of dogged suffering & strain on their faces. I first reached the wall of the moat [round the Houses of Parliament] at the angle so I could see the door plainly and Mrs Pankhurst and the elderly lady [Elizabeth Garrett Anderson] – over 70 years of age – with her. Then I saw policemen breaking up the little standards held by a group of women. I saw deputations pass along and ugly rushes and ever the crowd grew. I stood some time but I had to give up my place by the wall people pushed so and I was awfully afraid of getting crushed. So I got out to the road and there watched the deputations come along and saw the horrible hustling by the crowds of roughs and overheard the hideous laughter and remarks of the men looking on. Half of them made the remark that it was the funniest thing they had ever seen in their lives – all had their mouths open in an insane grin. One or two were so horrible that I just gazed upon them till they noticed me and moved away, not liking I suppose to be overheard. Several spoke to me – many indignant: ‘What good do you suppose this will do?’ ‘What else would you suggest?’ said I. Then he began the usual – that the militant methods had disgusted all nicely feeling people etc. I turned his attention to my two badges – constitutional societies, as I told him – and asked ‘What help have you ever given us?’ He walked away. Not one man did I hear speak on the women’s side. There may have been some, but not near me. I saw Captain Gonne led off & heard afterwards of his doings. Many women there were of the WSPU – and a few London Society [ie members of the constitutional NUWSS society] – all standing about perfectly wretched & green – cheering them on to battle and off to Cannon Row when arrested. One poor lady in her wheel chair [probably Rosa Billinghurst]– propelled by hand – followed in the wake of a deputation – generally 6 to a dozen people – she rang her bell violently and the crowd gave way before her – it was a funny but dreadfully tragic sight. As the crowd grew and the crowd kept being pressed back – I moved away and once, seeing some fighting women & policemen on the pavement coming my way, I stood back to the railing expecting them to go by. But, oh no – a burly policemen, taking me for one of a deputation, caught hold of me with an ‘Out you come’ and for some minutes I was tossed about like a cork on an angry sea, turning round and round – sometimes bumped on to a policeman – sometimes on a hospital nurse, who was fighting for all she was worth – pale to the lips but determined (and I afterwards saw her led off arrested ) – until I was with the others pushed out of the danger zone. The others went back but I sat down by the railing for a few minutes. I can’t say the man actually hurt me and I was too excited to realise quite what was happening and I was so thickly dressed as not to feel the bumps much – but it wasn’t nice. I don’t know I could have spoken if I had wished to – but I didn’t wish and I didn’t speak. What I felt was – I am not going to get out of the trouble by saying I am not one of them for I am in heart and anyway he will probably think I am trying to trick him and it will do no good and if these women can stand so much I can stand this little. And of course it was nothing really – only a new experience. Two ladies – one quite elderly came out of their first battle determined not to go back into it. They were a pitiable spectacle – their nerve had gone. One felt so sorry – they were beside themselves and were not aware they had in fact turned ‘coward’. A little lady – evidently there to plead with the faint hearted – spoke quietly to them, urging them to go when they felt rested. ‘But we couldn’t’, they said, ‘we have been half killed’. ‘Oh, but you must – you must go back again and again and again’ and so on. And I spoke to them – thinking an outsider’s word might turn their attention. Their eyes were brimming. They told me that they were supposed to go on till their strength was exhausted – they thought theirs was – but it wasn’t. But poor souls – their fight – of course they had never realised the awfulness of the business and what they would have to endure until they should fall fainting or injured. I wonder if they went back. Perhaps courage did come back to them but who could blame them – they were very saddening. I couldn’t seem to leave even when I had crossed to the station side. I stood and watched the arrested being led off – & gave them a send off – but soon after 2 I gave it up and, leaving the horrid spectacle, went in to Westminster Bridge station. They were beginning to clear the Square of people. Hundreds of policemen were arriving and one could less than ever see the plan of it all. A lot of Yankee sailors had been mystified but delighted and a lot of people were frankly puzzled by it all – and it was a sad business explaining to them. I got back cold to the bone – fetched my lunch on a tray – and was glad of hot soup. Wrap-around paper covers, 226 pp, over 70 illustrations, all drawn from Kate Frye’s personal archive. 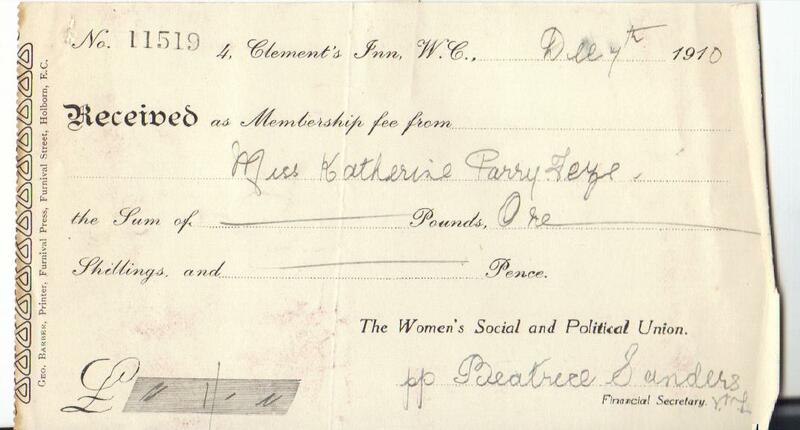 This entry was posted on May 20, 2013, 8:42 am and is filed under Kate Frye's suffrage diary. You can follow any responses to this entry through RSS 2.0. You can leave a response, or trackback from your own site.